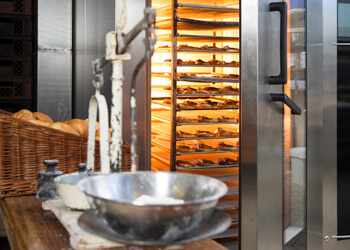 Leading manufacturers of bakery equipment throughout the world rely on LTG fans in their dough proofers, ovens and baking machines. You too can produce top-quality bakery goods by optimising your air flow. Our common objective is to help you achieve consistently high quality in every batch while maximising your productivity and minimising your energy costs. LTG fans take you a big step towards this goal. They accelerate fermentation and baking, and they improve the consistency and uniformity of the products. LTG fans create ideal climatic conditions, ensuring perfect results: uniform browning, a crispy crust and a soft crumb.Our axial and centrifugal fans play a key role in bakery equipment. Whatever type of fan you ultimately choose – tangential, centrifugal or axial – each will generate a perfectly formed, homogeneous air flow and ensure a high level of energy efficiency. Improve your production system with LTG fans, and create delicious buns, pretzels, croissants, biscuits, crackers, waffles or snack foods. You can be sure of top-quality products and significant energy savings. Our product portfolio includes fans with superior performance in all designs and sizes. LTG fans for bakery equipment can be supplied with special materials, seals etc. Fine-tuned machinery is particularly important in food production. LTG centrifugal fans are used mainly for air circulation, and our popular LTG tangential fans distribute air very evenly over large areas. For many years, these efficient, top-quality fans have successfully been used to circulate hot gases in baking processes and in dough proofers. Are you aware of the potential of air technology but don't quite know how you could benefit from it? Our engineering services can help. We use flow simulations to show the possibilities before the prototype stage, in this way significantly shortening the development time of ovens or conveyor systems. Talk with us! 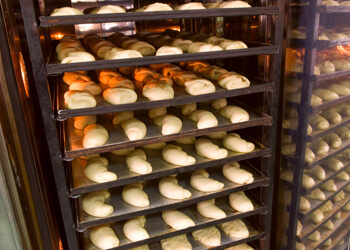 Our loyal customers include manufacturers of dough proofers, ovens and continuous flow systems. They recognised the advantages of LTG products, in particular tangential fans, at an early date and have been using them successfully for many years.